If you aren't convinced yet that DSDW is the best dance studio in town ... read on!! March 26 · Ms. Debra extracts excellence from each and every one of her dancers! I was blown away by the talent, technique and class demonstrated in the Debra Sparks Dance Works performances. The teachers and dancers genuinely love, support and encourage each other. Choosing the right dance school makes all the difference in the world. My daughter is blessed to be part of the Debra Sparks Dance Works family! February, 2017 · We have been a part of the studio for over 13 years. Always a perfectionist of technique while providing lifetime friends and memories. February, 2017 · DSDW is a positive and caring environment that nurtures dancers of all ages. June, 2016 · Thank you Miss Deb and Miss Tam for a wonderful year! The recital was so beautiful, I was truly impressed! June, 2016 · This was our first year at DSDW! My 5 yo daughter loved being a part of the Little Rock Stars class. Ms Emily was awesome. She is always happy and kept each class fun for the kids. We will definitely be taking more classes in the future. June, 2016 · Wonderful teachers, wonderful students, quality instruction and all around incredible place for our daughter to grow as a dancer. June, 2016 · My kids absolutely love love it! As a parent, what I like most is the positive attitude and self esteem and love Ms Debra and the staff help build in the girls. May, 2016 · DSDW is a wonderful place to foster your child's love of dance. The nurturing environment and wonderful training have made my daughter a poised young lady, and a committed, aspiring ballerina. DSDW students learn to be kind and supportive of each other. And, they have so much fun! April, 2016 · DSDW is my daughter's second home. We love it here! The studio offers high caliber instruction in a nurturing environment. My daughter has blossomed into a beautiful dancer under the instruction of Miss Debra, Miss Tamara, Miss Jenn and Miss Emily. She has learned that commitment, dedication and hard work pay off! The friendships and connections that she has made with her teammates are invaluable. These friendships and memories will last a lifetime. As a parent, I could not ask for a better place for my child. We are very grateful to be part of the DSDW family! February, 2016 · Excellent dance school for young girls that not only makes them good dancers but confident young ladies! June, 2015 · DSDW fosters young talent and brings out the very best in each student. I would not be a professional in the business without this studio. If you want to give your child the best opportunities out there, you should start by sending them to dance here. October, 2014 · We are in our 7th year at Debra Sparks Dance Works! The dancing and recitals are always amazing. So much hard work goes into the production all year and what results is a beautiful show and girls that love and respect each other. Thank you Miss Deb and Miss Tam! My daughter has been dancing at DSDW since pre-k almost 7 years. It’s her second home. Deb, Tam and all of her teachers foster an environment of learning, passion for dance and most of all teach these young ladies confidence and poise as they become young adults. The best studio in all of bucks county! Debra Sparks is a second home to me and i am so grateful to have the students and staff in my life! Ms Debra never fails to put a smile on my face and inspire my love of dance! Debra Sparks Dance Works is an amazing studio and i am so glad to be a part of it!! After studying at Debra Sparks Dance Works since I was 2, I could give you a million reasons why parents should choose this studio for their children. The studio does not tolerate jealousy and is full of great staff and dancers along with a strong repertoire. Debra Sparks Dance Works is the perfect environment for young women to grow as both dancers and ladies. Ms. Debra’s teaching style uplifts the spirit of every dancer and encourages all of her students to work to the best of their ability. The children are like family at DSDW and it is all thanks to the wonderful job of Ms. Debra! DSDW is a second home to me. Ms. Debra does a wonderful job teaching us how to be confident and elegant young ladies who always strive to help others. I've met some of the sweetest girls I've ever known here and I couldn't be happier with my dance family. Debra Sparks is like one huge family! I have met some of my closest friends and all of the teachers are so nice and helpful to everybody! Miss Debra is so sweet and works so hard to make sure all of her students are happy and continue to grow as dancers and as people. I love Debra Sparks! I've been dancing here for 13 years and it’s the best decision I’ve ever made. The staff and dancers are like a second family. I couldn’t imagine what my life would be like without this place. Debra Sparks is the best dance studio in Bucks County! All of the teachers and students are the sweetest people you will ever meet! The training is also the best you can find!! I love the studio so so so much!! All of the teachers hear taught me so much and everyone is so sweet!! I met some of my best friends here!! Best Studio in Bucks County!! DSDW is more than a dance school to me! It is my home! Having danced at DSDW for 14 years, I have met my best friends, grown as a dancer, and most importantly, grown as a person. I can not thank Ms. Debra and her staff for creating such a loving and welcoming environment at the studio! I ️ DSDW! Mr Ski does a great job with the boys hip hop, our son enjoys it so much! DSDW is a second home and family for my daughter. We have always been extremely happy with the high quality dance instruction and life lessons about grace, hard work, and perseverance that she is learning through her time at the studio. One cannot find a better studio at which his/her child could study dance. At DSDW, the students are treated with true love and respect. Ms. Debra and Ms. Tamara strive to bring out the best in their students, both as dancers, and as individuals. No matter what the skill level or ability of the student, everyone at DSDW is treated as a valued member of the family. When one sees the impressive talent at this studio and the accolades that have been bestowed, it is natural to assume that there must be a spirit of competitiveness among the dancers, but the opposite is true. Ms. Debra and Ms. Tamara make it clear that only kindness and generosity will be accepted, and that team spirit really shines through. By studying dance at DSDW, my daughter has not only come a long way as a dancer, but also as a student. Learning to focus in her dance classes has helped her to apply that same focus to her studies, and improve her grades. Finally, DSDW is somewhere my daughter calls a second home. She is a second generation in our family to study under Ms. Debra and Ms. Tamara, and holds the two of them in the highest regard. They are role models for her, and two adults that she admires with great affection. During the last academic year, my daughter had a very difficult time at school with the typical “mean girl” nonsense, which really battered her self-esteem. Of course, as her family, we worked to bolster her confidence to ignore the negativity. However, having two wonderful influences like Ms. Deb and Ms. Tam providing positive feedback and encouragement was more of a help than they will ever know, and for that, we are eternally grateful. Be confident that choosing to send your child to the Debra Sparks Dance Works is a decision you will be glad you made for years to come. DSDW has been an amazing place for my daughter to grow as a dancer and an individual. The poise and grace she learns at DSDW reflects in other aspects of her life.She is only 9 yrs old but will sign up for hours and hours of dancing as long as it is at DSDW! Highly recommend DSDW. Dear Ms. Deb, Now that the excitement has subsided, I take pause to write this note to you expressing my thoughts about you, your staff, and your amazing school of dance. For many years now, the Debra Sparks Dance Works has been an integral part of our family. Most of our daughter's/granddaughter's conversations and interests are about DSDW and I think you are aware that 100% of Paige's world evolves around the planet "SPARKS". She lives and breathes "dance". It was truely a banner day when Kerry discovered your wonderful school. It has become not only an integral part of Kerry's, Paige's, and Heather's lives, but has also become part of Carole's and my life. You have taught our granddaughters devinely, but you have also imparted your grace, poise, charm, and good manners. Your influence can only serve as a positive example for them to follow wherever the road of life takes them. I'm sure that Kerry has thanked you many times for your help, your direction, and even your love for our dear girls. Now on behalf of Carole and myself, I thank you. The show was amazing! We enjoyed it thoroughly! My husband and son were impressed by my daughter’s improvement, even with her injuries - thank you so much for the wonderful instruction and support! It was a difficult year for her, but she feels like it was successful because of your attention and kindness. I am grateful beyond words, as dance is the most important thing in the world to her. I just wanted to tell you how beautiful your recital was and the ballet was amazing! My daughter loves coming to dance and seems to have improved a ton thanks to you and your great style and flare for teaching and correcting. First off I want to say thank you so much for making my first year at Debra Sparks Dance Works spectacular! This year you helped me turn my dancing career around in a good way. Thanks to you, if I wanted to do something with dance in the future, it would now be somewhat possible. I remember I came to the Ballet Jazz 6 class to try it out and see where I would fit in. By the end of the class, I couldn't move a muscle. I watched the other girls show you each move so elegantly and was wishing I could be like them. Even though in the beginning it was really hard to keep up because I was tired or didn't feel well, you, Ms. Deb and Ms. Tam, are what kept me going with always saying the positives. I am so grateful that I am lucky enough to dance four nights a week with such great teammates and teachers. I have been dancing for 9 years now and this year by far has been the best year at dance that I have EVER had! I hope that one day I could maybe be on the competition team. Thank you again for making me an elegant young lady and for always showing me the bright side of every problem. I am so glad that I joined this studio this year and couldn't ask for any better teachers! Have a great summer and can’t wait until we have summer camp. Xoxo. The show was fabulous! The dancers are so talented and the choreography is beautiful. Our family really enjoyed watching my daughter’s growth and development after a year of being at the studio 5 days/week. She really “came to life” on the stage this year. The little special parts that you and Tam assigned to her to help boost her confidence had a big impact. She tries hard to balance soccer and dance… (which is important to us as we try to keep her active and fit) and this year’s show really encouraged her to work hard at dance and now she is looking for ways to take more classes in the fall. Oh boy! Thank you for your on-going support. Thank you for a great year. Loved every minute of every class! Can't wait for September. Ms. Deb and Miss Tamara, thank you for a fabulous show and year!! I can’t tell you how very much my daughter’s love of dance has grown this year. 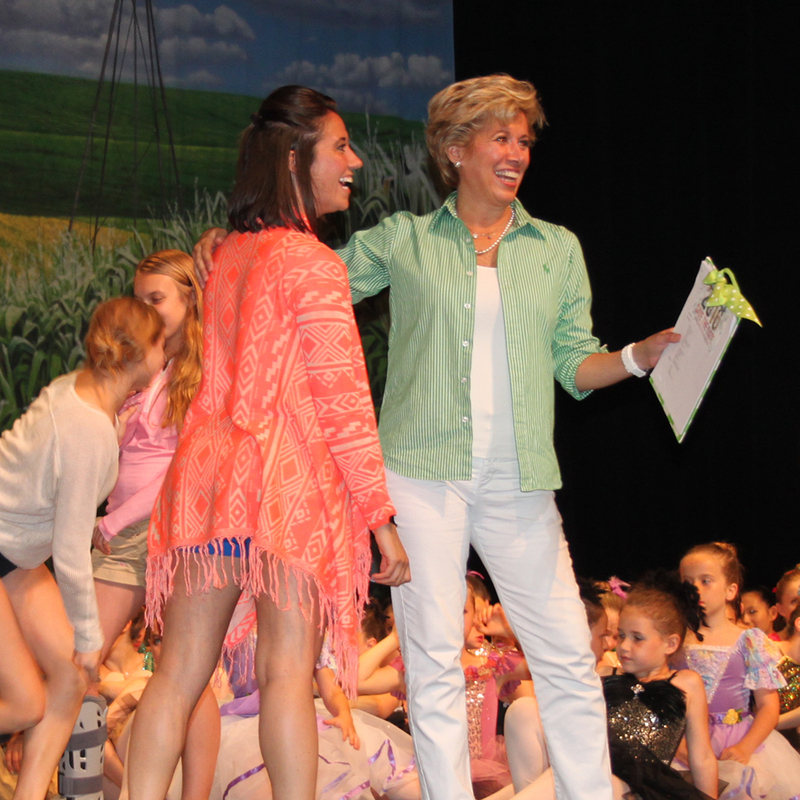 I attribute it to the wonderful way you teach, your love of dance, and love for your students. She misses dance class already and runs to the mailbox everyday to see if her recommendations have come! From the bottom of my heart, thank you both! Thank you for a wonderful show. It’s so nice to see how much my girls have improved during the year. Your studio overall is doing such a wonderful job because my girls always love to go to class. Thanks again and have a relaxing summer! This is for Ms. Debra: I wanted to send my gratitude for the training she gave me as a dancer. I attended the school when it was in Northeast Philly. Though I stopped dancing midway through high school, I did return to it years later and just performed at the Dance New Amsterdam in NYC as a featured soloist with the New York Theatrical Dance Conference. Throughout my dance journey, my technique has always been remarked on and I know that's because of the very strong foundation Ms. Deb gave me. This, plus an attention to stage presence, have set me apart from other dancers in my field and Ms. Deb's face silently mouthing the words, "Smile girls!" from offstage is largely responsible for this. I have been performing in the tri state area for the last year now, teach a weekly class in Haddon Township, NJ, and will be offering a workshop in NYC in August. I'm so thankful dance is in my life and very grateful to Ms. Deb for helping me get here. So glad to see the school is going strong!